Total disinvestment achieved in the last three years (2014-15 to 2016-2017) was Rs. 87,714 crore as against Rs. 53,670 crore in the previous three-year period; A system of Rolling Plan has been brought-in to take advantage of the market conditions without any loss of time and with an element of surprise for the market players among others. With a vision to promote people’s ownership of the Central Public Sector Enterprises (CPSEs) and a share in their prosperity through disinvestment, and efficient management of public investment in CPSEs for accelerating economic development and augmenting Government’s resources for higher expenditure, the Department of Investment and Public Asset Management (DIPAM), Ministry of Finance, has been working tirelessly to achieve these goals. The major achievements of DIPAM in the past three years are outlined below. 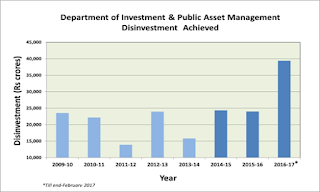 The total disinvestment achieved in the last three years (2014-15 to 2016-2017) was Rs. 87,714 crore as against Rs. 53,670 crore in the previous three-year period. The average yearly realization of Rs. 29,238 crores during the period between 2014-15 to 2016-17 (last 3 years) vis-à-vis Rs. 19,873 crore for the period between 2009-10 to 2013-14 (5 years) represents an increase of 47%. Based on the suggestion made by DIPAM, the Securities and Exchange Board of India (SEBI) through its circular dated 15th February, 2016 has reduced the notice period for an Offer for Sale (OFS) transaction from T-2 to T-1 (T being the transaction day). This change is now helping in minimizing price hammering between the notice day and the transaction day, which used to take place earlier under the T-2 dispensation. The Government is evolving an Equity Culture and has made the CPSEs’ disinvestment programme more inclusive by following an approach to reserve 20 per cent of shares in CPSEs-OFS transactions for retail investors on a case to case basis. 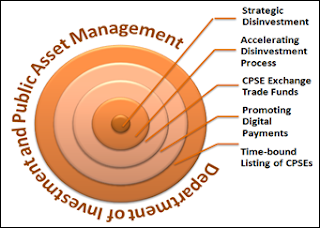 The CPSE ETF allows the Government of India to simultaneously divest multiple stocks spread across various sectors in one bundled instrument, thereby reducing overhang on individual stocks and maximizing the sale proceeds for the Government. The Government launched a Further Fund Offer (FFO) of the CPSE ETF Scheme. Overall, the issue got oversubscribed by 2.30 times – Rs. 13,802 crore worth of applications were received as against the maximum issue size of Rs. 6,000 crore. The number of Retail applications was 2,70,712 (approx. 7 times the Retail applications received during first tranche held in March 2014), with corresponding value of Rs. 2,465 crore. This was one of the largest retail offering (Government / Private) in capital market in last few years. The Government realized an amount to the tune of Rs. 6000 crore through this offer. As a part of the initiative to fast-track strategic disinvestment of CPSEs, the Core Group of Secretaries on Disinvestment (CGD) was constituted on 21st March, 2016. Based on the report of the NITI Aayog and the recommendations of CGD, the Cabinet Committee on Economic Affairs (CCEA) in its meeting held on 27th October, 2016, has approved, ‘in-principle’ the proposal for strategic disinvestment of some CPSEs, units of CPSEs and subsidiaries of CPSEs. 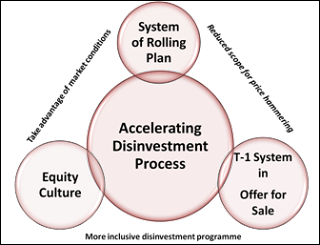 For the purpose of uniformity and efficient implementation of strategic disinvestment transactions, the 'flow of activities' to be completed within a specified time in respect of disinvestment of Government equity as well as disinvestment of equity of parent CPSE, subsidiary and sale of units of CPSEs has been prepared and communicated to the concerned Administrative Ministries/Departments for completion of the activities within the specified timeline. The objective of strategic disinvestment includes the Government exiting from non-strategic business, unlocking optimum economic potential by promoting efficiency & professional management in such companies. To promote digital payments, BHIM application has been launched that facilitates digital payment transactions through UPI and USSD modes. The acceptance infrastructure is being ramped up through procurement of Aadhaar ready PoS machines. Further, alternative acceptance options through QR code have also been developed. A number of incentives have been provided to encourage digital payments amongst merchants and consumers. Capacity building and awareness campaigns have been launched by various Departments and State Governments to promote digital payments. The Business Correspondents network is being expanded through inclusion of Fair Price Shops and Post Offices to provide digital transaction options at various geographically convenient locations. Seeding of Aadhaar and mobile numbers in the bank accounts is also underway to enable the accountholders to undertake transactions through mobiles or Aadhaar authentications. The Budget 2017-18 announced to put in place a revised mechanism and procedure to ensure time bound listing of identified CPSEs on stock exchanges. This will enable unlocking the true value of the company and promote ‘people’s ownership’ by encouraging public participation in CPSEs, making them accountable to its shareholders. DIPAM has issued circular dated 17.02.2017 on the mechanism and procedure, along with a list of activities with indicative timelines, for time bound listing of CPSEs by all the Administrative Ministries/Departments.